In the tradition of Wheat Belly and Grain Brain; No Grain, No Pain demonstrates the proven link between a gluten-heavy diet and chronic pain and discomfort—and offers a groundbreaking, 30-day, grain-free diet plan to help you heal yourself from the inside out. But all of this medication simply isn’t helping, and as Dr. Peter Osborne, the leading authority on gluten sensitivity and food allergies has found, the real solution often lies in what you eat. In No Grain, No Pain, Dr. Osborne shows how grains wreak havoc on the body by causing tissue inflammation, creating vitamin and/or mineral deficiencies, and triggering an autoimmune response that causes the body to attack itself. But he also offers practical steps to find relief. Using his drug-free, easy-to-implement plan, you will be able to eliminate all sources of gluten and gluten-like substances, experience significant improvement in fifteen days, and eliminate pain within thirty days. No Grain, No Pain is the first book to identify diet—specifically, grain—as a leading cause of chronic suffering, and provides you with the knowledge you need to improve your health. Based on extensive research and examples culled from thousands of his satisfied patients, Dr. Osborne recommends changing your diet to achieve the relief that millions of Americans have been seeking once and for all, leading to a healthier, happier life. Dr. Peter Osborne is the clinical director of Town Center Wellness in Sugar Land, Texas. He is a doctor of chiropractic medicine and a Board Certified Clinical Nutritionist focused on the holistic natural treatment of chronic degenerative diseases with a primary focus on gluten sensitivity and food allergies. Dr. Osborne lectures nationally to doctors on gluten sensitivity/intolerance, celiac disease, and many other nutritionally related topics. He is the cofounder of Nutra-MD and the Gluten Free Society. "A must-read book for anyone suffering with chronic pain. Dr. Osborne transforms the way we need to look at not just gluten, but most grains and their impact on autoimmune disease and inflammation." "There are a few people I turn to when I need sound health advice. Peter Osborne is one of them. He's one of the smartest natural practitioners and easily one of the world's leading authorities on going gluten free. This book is far overdue and brings together Peter's immense knowledge and years of experience helping hundreds of pain suffers regain a happier, pain-free life." "We have a new normal and it, unfortunately, includes chronic suffering that falls through the cracks of conventional medical attention. Pain, in its many manifestations is an arena where prescription treatment can generate further complexity and leave patients with issues of incomplete relief, side effects, and dependency. Here we have an elegant solution that can offer, not only real time results around pain, but also the potential for full body transformation. Dr. Osborne provides the history, the why's, and the how's to take back your health, one meal at a time." This book is the much needed evolution of the conversation about gluten. Dr. Osborne takes the topic to a whole new level of understanding and sheds light on the fact that gluten is not the only enemy within grain that is capable of causing pain and disease. Dr. Osborne also creates a brand-new awareness about pain being from hidden internal chemical causes as well as the obvious structural causes. Any one of the millions of people with unexplained pain can benefit from this material. "Dr. Peter Osborne brings hope and healing to people with pain in his new book No Grain, No Pain by looking for the underlying root causes of pain disorders. This book will give you the information you need to become pain free without the use of habit forming medications! If you are currently suffering with pain, please read Dr.Osborne's book- it may just save your life." 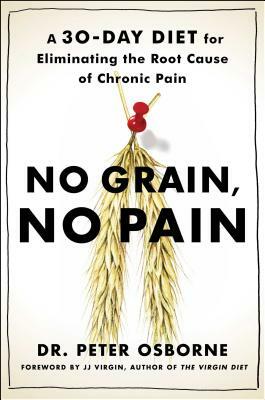 "The relationship between grain consumption and pain has never been so thoroughly analyzed as with Dr. Osborne's new book. After many years of tireless research and clinical experience, Dr. Osborne has produced an excellent resource on the theoretical motivation and practical tools needed to take back control of one's health."